The following recipe, prepared by Jerry Finzi, appears on GrandVoyageItaly.com. Of course, I was first introduced to pot roast by my Mom, but being a working mother, she always looked for shortcuts–a big thing for moms back in the 50s and 60s. Although it was delicious, her shortcut was to use cans of Campbell’s Onion Soup and to cook it in her very scary, rattling pressure cooker. Even as I moved on to my own life, she loved making this for me as a special treat, believing it was my “favorite” meal. (I really liked her lasagna much better). Well into my 30’s, as I developed my own culinary skills, I wanted something more authentic, so I opted for using sweet onions like Vidalia or Walla Walla to add a sweet, deep flavor to my version. In recent years, I’ve developed my Italian Style Pot Roast, reminiscent of Sugo (Sunday Gravy), but with a much lighter stew type sauce. In Italy, this type of recipe is called Stracotto (literally, overcooked), because of its slow cook time. 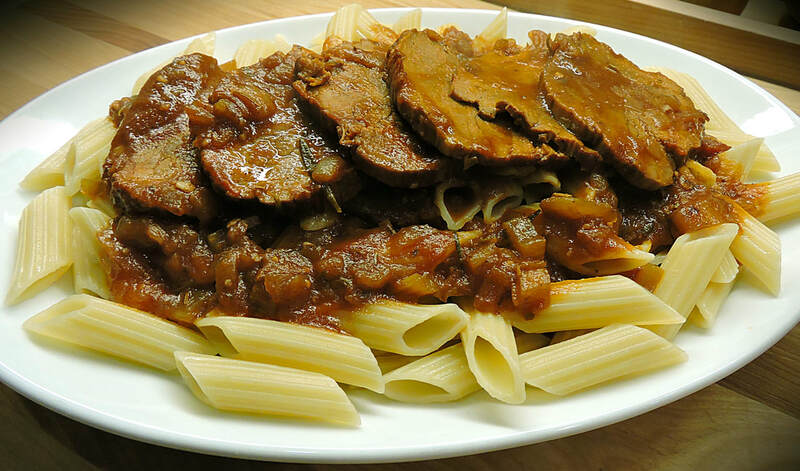 Another name for this recipe, or rather, style of preparation is simply Brasato di Manzo (braised beef). Simple ingredients, make a robust meal. To ensure that the meat is tender, you should plan this as a weekend meal, allowing most of the afternoon to slow cook the roast on a gas range (OK, electric would be fine also). Yes, as my mother did, this pot roast isn’t done in the oven but rather in a heavy pot on a cooktop. This method takes a minimum of 4 hours of slow-cooking. Technically, it’s a braise and not a true roast. (One day soon I should show you how I do my Dad’s Oven Roasted Beef). I cook mine in our tri-bond, stainless steel, flat-bottomed All-Clad Stockpot, rather than our Dutch oven. I find the wider base spreads the heat out rather than concentrating it in the center, as the narrow-bottomed Dutch oven does. (Which would tighten the proteins in the beef rather than relax them). I also use a heavy cast iron Heat Diffuser over our medium diameter gas burner to diffuse the heat even further. I suppose I could also use one of our other options, like our Staub Coq au Vin Cocotte or our Emile Henry Brasier(for a smaller roast) but I like working with steel. You will see cuts of beef labeled “chuck roast” in the supermarket, but you can use pretty much any type of beef–as long as it’s a tough cut–not tender. 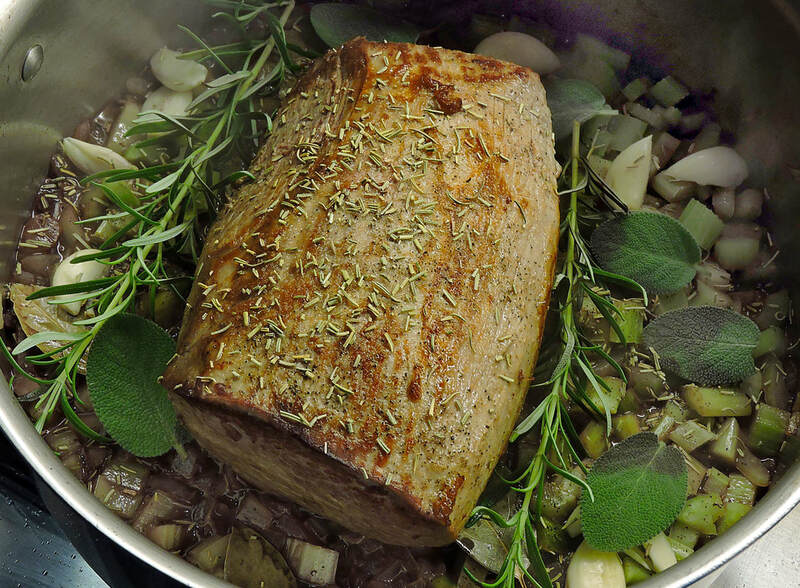 A slow cooking time and very low temperature really define the process–not the cut of beef. Pot roast is a braise (slow cooked in liquid) that cooks at a low temperature for a long period of time. Chuck: From the front portion of the animal. Look for chuck roast, shoulder steak, boneless chuck roast, chuck shoulder pot roast. In the case of shoulder cuts with lobed sections, you might have to use butcher’s twine to tie the roast into a cylindrical shape for better handling while browning. 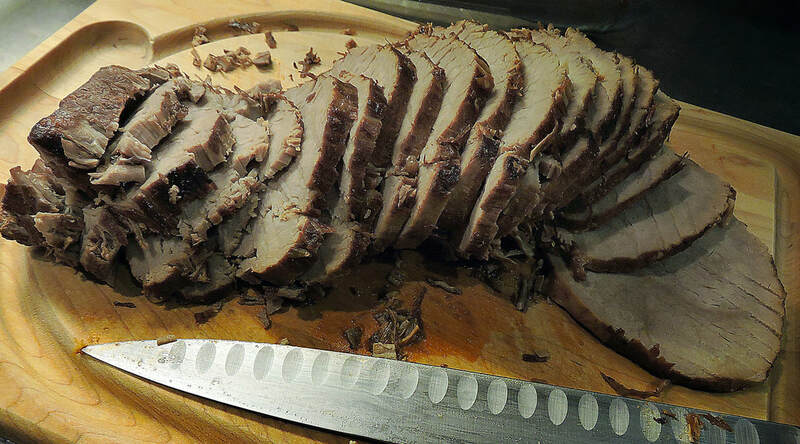 With a sharp paring knife, cut 6-8 slits into the beef on all sides, about 2″ deep. Shove a clove of garlic deep into each hole. These will impart amazing flavor into the roast as it cooks. Wait until the pan is hot, then place your roast into it, with the fat side facing downward. You should hear a sizzle. If your pot isn’t hot enough, the roast will stick. After browning the first side, use tongs to turn and brown all sides equally. Don’t forget the ends–standing the roast up on its ends and leaning on one side of the pot usually works well, otherwise hold in place with tongs. Remove the pan from the heat at this point, and place the roast on a dish while you prepare the vegetables. Do NOT wipe out or clean the pan. After the roast is tender, but before reaching a “fall apart” stage, remove the roast and place onto a cutting board, letting it cool to the touch for a few minutes. Slice into half-inch slices. Carefully, return each slice back into the pot, making sure each one is under the surface of the sauce. Continue cooking on a low temperature for an additional 30 minutes. This should make your slices fork-tender–you won’t need a knife when eating.